Many packs of playing cards are produced in Morocco anonymously. There are no inscriptions or manufacturer's details on any of the cards. Usually these are found on the Ace of Coins and the Fours of Coins and Cups, or the wrapper. As can be seen in the examples shown below, these packs are usually virtually identical, with only slight differences in the re-drawn images which faithfully conform to the old Spanish National Pattern as produced by Camoin of Marseille until 1971. The Kings' robes totally obscure their feet and the horses are bright blue. 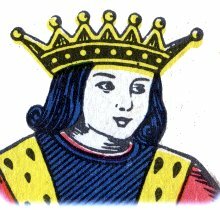 The motifs seen on the Ace of Coins and the Fours of Coins and Cups are modelled after the features on the same cards in the old Spanish decks. 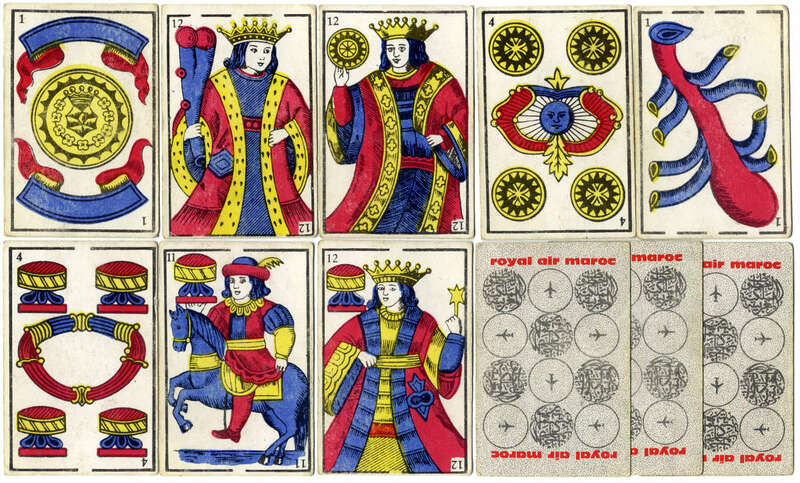 Above: anonymous Spanish-suited playing cards for Royal Air Maroc airlines, 40 cards. 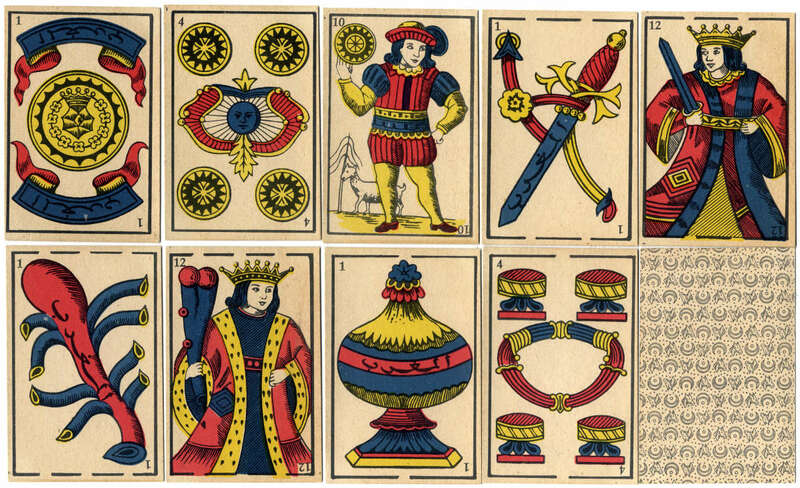 Above: anonymous Spanish-suited playing cards with Arabic inscriptions on several cards, 40 cards. Close inspection of the card designs, especially the faces, suggests this pack is by the same manufacturer as the above example for Royal Air Maroc. The back design has a repeating pattern of horse heads, moon crescents and dots. Above: anonymous Spanish-suited playing cards with a palm tree motif on several cards, 40 cards.